It’s division time! 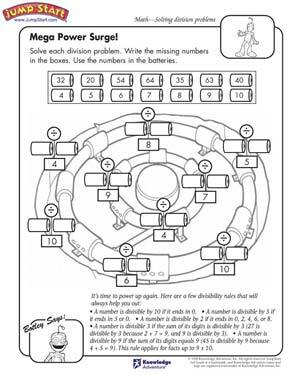 A great division worksheet for kids, ‘Mega Power Surge’ has a bunch of division problems that the little ones need to solve. In this worksheet, the answers to division problems are given, while kids need to fill in the missing numbers. The worksheet lists out a bunch of numbers right at the top. Kids need to choose numbers from this list to get the desired results!